When the zombie apocalypse comes, it”s not just those crusty old folks who will struggle against the undead, it”s young people. What happens when you come of age during the zombie apocalypse? Z: Zombie Stories has the answer to that question. Why did I read this book: I’m not really much of an anthology, collection, or short fiction kind of gal – but this anthology featured stories from Catherynne M. Valente, Kelly Link, and Jonathan Maberry. Zombie stories, no less. How could I resist? 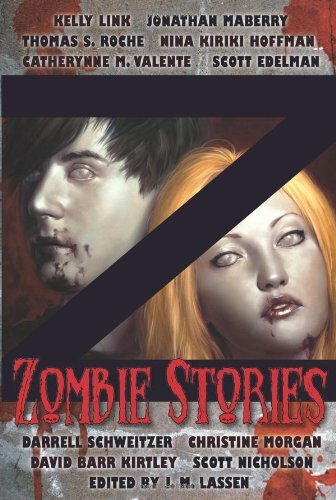 Z: Zombie Stories is a collection of young adult zombie fiction, culled from assorted books and publications over the past two decades. All of the stories in this anthology (save the final entry from Thomas S. Roche) have been previously published – a fact that I completely missed when I started the book. Having read Rot and Ruin, imagine my surprise when I started Jonathan Maberry’s “Family Business” only to find that it was the same (truncated, introductory) story! Luckily, that was the only entry of the bunch that I had read, so diving in was as simple and smooth as incisors biting through a pile of fresh, juicy, warm brains. “Family Business” by Jonathan Maberry tells the story of angry, young Benny Imura, who resents his sickeningly responsible older brother Tom. In a post-apocalyptic world, Benny resists joining the family business of zombie killing – but as he’s just turned fifteen, the law dictates he get a steady job and give back to society. Faced with no other alternatives, Benny reluctantly learns the ropes from Tom, and discovers that his older brother has depth and secrets he never could have imagined. This entry from Maberry is actually the first part of Rot and Ruin (a full length YA zombie novel), and focuses on the strained relationship between two brothers from the (irritating) perspective of young Benny. I wasn’t the biggest fan of Rot and Ruin, though I eventually came around once Benny stopped acting like such a ginormous, self-entitled tool – unfortunately, “Family Business” focuses entirely on this early characterization, leading up to Benny finally realizing just how tough Tom’s job is. It’s a great character arc, and “Family Business” does a great job of insulating and encapsulating that larger storyline in a relatively small amount of space. I don’t know why (other than some personal taste quirk), but Benny really, really annoys me and that high level of frustration distracted from my reading pleasure, both with the original novel and this shorter story. That said, he’s not written badly – it’s just a personal taste thing. “The Wrong Grave” by Kelly Link features another douchey teenage dude protagonist. When Miles’s girlfriend Bethany dies, he’s distraught and romantically decides to bury his numerous love poems with Bethany in her coffin. Ten months later, though, he wants his poetry back to enter a contest (and, idiotically, Miles didn’t save or make copies of his work). The only way to get his work back is to dig it up Bethany’s grave… but he accidentally digs up the wrong dead girl. A strange, macabre story, written in Kelly Link’s trademark quirky style, “The Wrong Grave” is a wryly funny and ultimately touching story about life after death – for both the living and the dead. “The Days of Flaming Motorcycles” by Catherynne M. Valente is one of my favorite stories of the anthology, told from the point of view of Caitlin Zielinski, the last non-infected person in Augusta, who knows more about the so called “zombies” than it seems anyone else does. Eloquent, precise, and beautifully written, “The Days of Flaming Motorcycles” shows a different side of the infected – that of remnant intelligence and the ability to grieve. “The Barrow Maid” by Christine Morgan is another clear favorite from this anthology, a Norse Viking tale of destiny and revenge from beyond the grave. When the great, heralded warrior Sveinthor the Unkillable is inexplicably killed in battle, his beautiful wife Hildirid proudly drinks poison and lies by his side at his grave to accompany him to Valhalla… except she wakes up hours later, still alive. Due to a profound act of treachery, the great Sveinthor and his king father have been betrayed and Hildirid has been spared, but that won’t save the traitor or the invaders from Sveinthor’s reach as he rises from the grave to mete out his grim justice with Hildirid, his beloved barrow-maid, by his side. “You’ll Never Walk Alone” by Scott Nicholson tells the story of a boy and his father as they take refuge in their church and faith from the zombie apocalypse, hiding from those that are “gray” and punsihed for their sins. Written in heavy-handed country dialect (i.e. “The sun come up higher and I wondered about the cows. Did the gray people eat them all? It wasn’t like they ain’t enough sinners to go around.”), this story wasn’t my favorite, but does examine the apocalypse from a different perspective than any other entry in this anthology. “The Dead Kid” by Darrell Schweitzer feels a lot like Stand by Me (or, more appropriately, “The Body”) from Stephen King. There are a couple of violent, sick bullies that find a dead boy that isn’t quite dead, and decide to keep him around for fun. Davey wants to fit in with Luke and his tough crowd, but discovers that fitting in comes at a high cost – and inexplicably finds his life changed for the better by the dead kid. I liked the idea of this story and the examination of the draw that bullies have on others, but wasn’t a fan of how the author chose to end the story (with a bit of a cheesy, moralizing look into the future and how senseless Luke and his whole crew were their whole lives – there’s really no need for the explicit message-making). “Seven Brains, Ten Minutes” by Marie Atkins is, if nothing else, memorable. Eerie. Super weird. Disgusting. There’s this boy, see. He likes this beautiful, bitchy girl, and decides that to save her and impress her, he’s going to win a competition…for zombies. He’s not a zombie, but he pretends to be one in order to beat a brains-eating record. Need I say more? In what universe would this master plan end well? Delightfully squishy, and juicy, and entirely gross. The Third Dead Body” by Nina Kirki Hoffman tells the story of a reanimated murdered prostitute, following two other murdered prostitutes before her, finally has her revenge on her killer. Stumbling a little in its execution and a little unclear as to who Sheila really is and how she’s become the way she is (embodying the spirits of the fallen, murdered women before her), I loved the concept of this story and its melancholy end. “The Skull-Faced Boy” by David Barr Kirtley is another memorable entry, featuring two different types of zombies – the mindless, rotted corpses of old, and the newly converted dead capable of higher cognitive function and manipulation. Oh, and it’s also a story about two friends fighting over a girl. One of them wins…sort of. “The Human Race” by Scott Edelman was probably my least favorite of all the stories, only because the juxtaposition of zombies and terrorism felt extremely heavy-handed to me, not to mention the fact that an act of terrorism followed by the zombie apocalypse is just a *little* bit over the top. “Deepwater Miracle” by Thomas S. Roche brothers speed away from pirates and zombies on a boat. That’s unique. Action packed, zippy, and the only story in this anthology that is original to the anthology, I enjoyed this fun, nautical zombie take. Like any collection or anthology, some stories are bound to be stronger than others and such is the case with Z: Zombie Stories. I’m not sure that the anthology truly is indicative of YA/coming-of-age zombie fiction, but the highs of the book outweigh the few duds. Recommended for the short fiction fan. Now, zombies aren’t supposed to get sad. Everyone knows that. I’ve had a lot of time to think since working down at the Java Shack on Front Street became seriously pointless. I still go to the shop in the morning, though. If you don’t have habits, you don’t have anything. I turn over the sign, I boot up the register – I even made the muffins for a while, until the flour ran out. Carrot-macadamia on Mondays, mascarpone-mango on Tuesdays, blueberry with a dusting of marzipan on Wednesdays. So on. So forth. Used to be I’d have a line of senators out the door by 8:00 am. I brought the last of the muffins home to my dad. He turned one over and over in his bloody, swollen hands until it came apart, then he made that awful howling-crying sound and licked the crumbs off his fingers. And he started saying my name over and over, only muddled, because his tongue had gone all puffy and purple in his mouth. Caitlin, Caitlin, Caitlin. So now I drink the pot of coffee by myself and I write down everything I can think of in a kid’s notebook with a flaming motorcycle on the cover. I have a bunch like it. I cleaned out all the stores. In a few months I’ll move on to the punky princess covers, and then the Looney Tunes ones. I mark time that way. I don’t even think of seasons. These are the days of Flaming Motorcycles. Those were the days of Football Ogres. So on. So forth. Read “Family Business” in Chris Golden’s anthology “The new dead”, slow build up but the end was great. Awesome. Thanks for that useful review. I love zombie books so much I have 45 in my collection right now and plan on increasing it as much as possible. I just can’t get enough of Zombies. I even write my own zombie short stories.